In what will come as a surprise to virtually nobody, a new brain study shows that dogs don't just respond to our words, they also respond to how we say them. It's a finding that suggests dogs evolved their keen listening skills as a result of domestication. When we're listening to someone, we're not just responding to their words, we're also responding to the manner in which the words are spoken, such as emotional tone. As most dog owners will attest, their canine companions — though they may not understand everything that's being said to them — respond to tone in contextually appropriate ways. A new study is now offering some of the first hard evidence that these behavioral observations have a neurological basis, and that dogs are indeed capable of differentiating and processing various components of human speech. Researchers from the School of Psychology at the University of Sussex have shown that dogs react to both verbal and speaker-related information, and that these components are processed in different areas of the dog brain. Previous studies have shown that dogs exhibit hemispheric biases (left-brain versus right-brain) when listening to the sounds of other dogs. The researchers were curious to see if a similar effect occurs when they listen to humans talking. When playing various speech patterns from either side of dogs (everything from sine waves and whistles through to robotic vocalizations and actual verbal speech), the researchers tracked the dogs' head movements. A turn to the left indicated that the right hemisphere is more specialized in processing a certain kind of acoustic information, and vice versa. Indeed, results showed certain tendencies in their response to particular aspects of human speech. Familiar spoken commands showed a left-hemisphere processing bias, while intonation and speaker-related vocal cues showed a right-hemisphere bias. "This is particularly interesting because our results suggest that the processing of speech components in the dog's brain is divided between the two hemispheres in a way that is actually very similar to the way it is separated in the human brain," noted team member David Reby in a statement. This doesn't mean, of course, that dogs understand everything we're saying to them, but it does suggest that they're paying close attention to who we are, how we say things, and what we say. Which is hardly surprising. And what would be better than left-right head nodding would be some fMRI scans to definitely show which parts of the brain are responsible for language processing and under which contexts (along with a comparative analysis to human brains under the same conditions). Related: Can Dogs Tell When We're Talking To Them? Can dogs tell when we&apos;re talking to them? 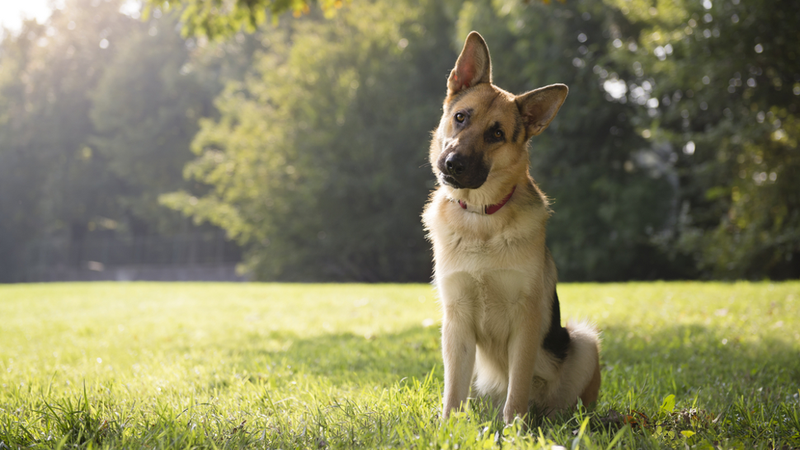 Interestingly, however, the study also points to the possibility that these listening skills came about as a consequence of convergent evolution between dogs and humans. Further tests of horses (another highly domesticated animal) and wolves (a non-domesticated dog-like animal) could shed some important light on the matter. Read the entire study at Current Biology: "Orienting asymmetries in dogs' responses to different communicatory components of human speech".